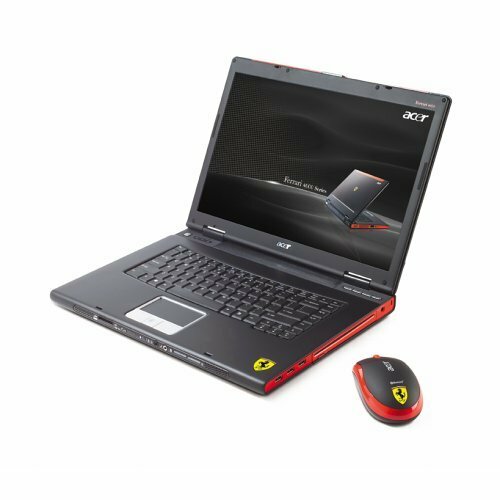 Acer Ferrari 4000 is a desktop replacement laptop based on its previous models the Ferrari 3000, the Ferrari 3200 and the Ferrari 3400. Acer Ferrari 4000 features AMD Turion processor, 15.4″ WSXGA+ LCD monitor, ATi Radeon Xpress 200 M or ATi Radeon Xpress 200 P, DDR 333 SoDIMM slots, DVD-RAM optical drive, ATI Radeon Mobility X700 with 128MB VRAM, 5-in-1 card reader, supports PCI Express bus, PCMCIA Slot, USB2.0, IEEE1394, Bluetooth and infrared connection. TrustedReviews reviews Acer Ferrari 4000 with overall rating of 9 out of 10 that Acer has put AMD’s Turion to good use this time, showing that it can match up to the Pentium M in pretty much every respect. The Ferrari 4000 really does look great and represents a huge step forward from the 3200 model that we looked at before. Feature wise you’d be hard pushed to find anything missing, while the price is quite staggering considering the spec. Overall a superb notebook, even if it’s not quite the retail specification. PC Magazine gives very good editor rating of 4 out of 5 and concludes that with hardware like the 1.8-GHz Turion 64 ML-34 processor, double the memory (1GB DDR RAM), and a faster hard drive, the Ferrari 4000 edged out the HP dv4000 on our SYSmark 2004 tests. The Ferrari 4000’s terrific graphics chipset trounced the dv4000’s integrated Intel chipset and helped the system achieve impressive gaming results. Battery life reached 3 hours 43 minutes, thanks mostly to the 71-Wh battery. Through a partnership with the legendary carmaker, the thin-and-light Ferrari 4000 has a dazzling new design and new components for extra kick under the hood. CNet gives the good editors’ rating of 6.8 out of 10 and concludes that Acer puts the pedal to the metal with the Ferrari 4000, a notebook that, like the Italian sports car, is powerful and turns heads. The good points include wide, high-resolution 15.4-inch screen, great performance, multipurpose flash card slot, trayless double-layer optical drive and 1GB of RAM. While the bad are lacks of instant-start media player, more expensive than comparable models and odd curved keyboard.